Mixed martial arts fighter Conor McGregor has told a court that he "regrets" a backstage brawl at an arena. 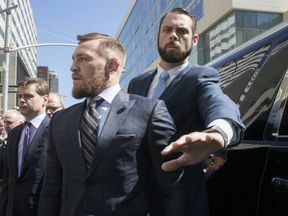 The 29-year-old Irish fighter was charged with assault and criminal mischief after an incident at the Barclays Centre in New York, and has now entered into plea negotiations. He and his co-defendant Cian Cowley were released on bail after a brief court appearance in Brooklyn and are due to return to court on 26 July. In a statement outside the court, McGregor said: "I regret my actions that led me here today. Assistant district attorney Janet Gleeson said the case had not been presented to a grand jury for indictment because of the ongoing plea negotiations.